Authors are ROCKSTARS! : Your chance to ask a question & win some books! It is giveaway time! 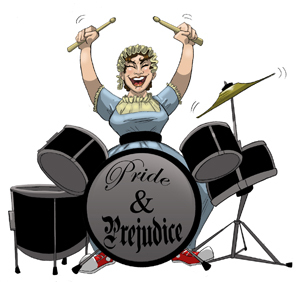 Rockin' Jane Austen is ready to party. Got a question you're just dying to ask New York Times bestselling author of the Across the Universe series, Beth Revis? How about Veronica Rossi, also a queen of sci fi with her Under the Never Sky series. And don't forget C.J. Redwine, whose debut book Defiance just blew us away. Well, it's your chance to ask them a question. We are interviewing Beth, Veronica, and CJ via Skype this week and we want to know what YOU want to know. Send us a tweet @AuthorsROCK or leave a comment here. We'll try to squeeze in as many questions as possible. :) Deadline to submit a question is Thursday January 3rd at 9pm Pacific. Every US Resident who leaves a comment here or via Twitter will qualify for a surprise ARC giveaway package! Also, before we sign off for today, a big congratulations to "Reader Roberts" who won our Karen Cushman & Princess of the Silver Woods giveaway. I've sent you an email with information on how you can claim your prize. "Have you always wanted to write science fiction, or did you come to it gradually?" Michelle and Allison, thanks for making amazing podcasts! Wow! What a great opportunity. I'll have to try to think of a question between now and the 3rd. Could you please speak about the balance of world building, character development and plot movements tying together in your first chapters? How do you introduce bits of these elements simultaneously without overwhelming/losing your readers? Here is a question for Beth: The more I listen to The History of Philosophy podcast the more I realize that the mention of The Republic in the Across the Universe series is more than just a passing thing and that I'll have to reread it to see if I recognize more Platonic influences. Have you studied philosophy or do you have a degree in Philosophy? Was The Republic the seed for this story or more of just an ingredient in the idea stew? I have a question for Beth! I know that in the past you had to write many manuscripts before you wrote Across the Universe. But are there any that stand out to you? Meaning, would you ever want to go back to the story again and, as a lack for better words, revise or rewrite it? I have a question for all of them. Do you think your idea could have worked if your book had been written when the world was in tact? How much research did you do to create the world in your books? Since your AtU series is coming to a close, what can we expect for your upcoming works? More sci-fi or are you going to go in a different direction? Allison, random.org chose you as our giveaway winner! Please drop me a line at michelle (at) authorsarerockstars.com and I'll mail out your prize pack of surprise ARCs. Wow! How awesome! I emailed! Has there ever been a time where you wish you could change something in your books because you didn't like it but was told to leave it alone? What made you decide to write a dystopian series? For all of them! If your characters could meet, would they get along? How much did your books change from draft to publication? When you write a series, do you know how the last book will end before you begin? For Beth - How have you not found a way to work Daleks into your books!? What is the most rewarding aspect of being a writer for you? Thanks for the fun giveaway! I always look forward to podcasts from you guys. For Beth Revis: I follow you on Twitter and Tumblr and you make writing seem so fun! What are your tips for keeping the writing process enjoyable when it's so much work?